Comscore has just released the latest data on Facebook growth patterns, which clearly show that Facebook’s recent push to expand abroad has paid off. The site has seen extremely high growth rates across Latin America, The Middle East, and the Asia Pacific. Europe, which accounts for a much larger user base, continues to grow at a steady clip as well. North America still accounts for nearly 40% of Facebook’s monthly growth, but its rate remains fairly constant, hovering at an increase of around 47,000 uniques over the last seven months. 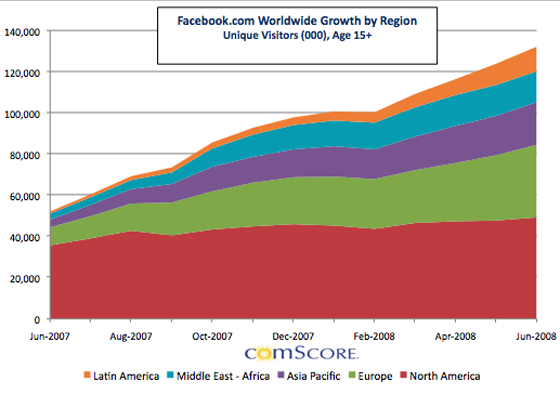 Earlier this year Facebook finally managed to catch up to MySpace’s total unique visitors, largely on account of its rapid global expansion (MySpace continues to dominate in the US market).